Victoire Ingabiré Umuhoza stands before the court in Kigali, Rwanda, after being arrested and charged with associating with terrorists and “genocide ideology,” a crime unique to Rwanda which includes “divisionism” and “revisionism,” i.e., attempting to revise the received history of the 1994 Rwanda Genocide. Gen. Paul Kagame, her would-be opponent, is engineering a re-run of the 2003 sham “elections” that brought Kagame to power with 95 percent of the vote. According to European Union election monitors, Human Rights Watch and the British Commonwealth Human Rights Institute, opposition parties were outlawed and opposition candidates jailed or exiled in 2003. 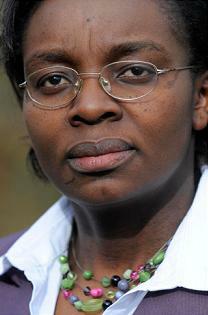 According to Erlinder: “The arrest of Madame Ingabire in the run-up to the 2010 election is a carbon copy of Kagame’s tactics in 2003 when all serious political challengers were jailed or driven from the country, including former Kagame loyalists, like the former president and prime minister, Pasteur Bizimungu and Faustin Twagiramungu. In late February 2010 leaked notes, in the original in the Kinyarwandan language, purported to report Kagame’s meeting with Rwandan ambassadors, who had not yet gone into exile. In the meeting, Kagame allegedly targeted some seven non-Rwandan lawyers, journalists and academics for public discrediting or assassination. Kagame had Erlinder’s name on his “hit list” even before Erlinder took on Ingabire’s defense, presumably for his role in genocide-planning acquittals in the International Criminal Tribunal for Rwanda (ICTR) Military-1 trial. Kagame has also declared Rwanda experts persona non-grata when they questioned his policies. Those he has named include Dr. Allison DesForges, Professor Filip Reyntjens, former U.S. Ambassador to Rwanda Robert Flaten and Hotal Rwanda hero Paul Rusesabagina. Recently, U.S. political scientists Dr. Alan Stam of the University of Michigan and Dr. Christian Davenport of Notre Dame have analyzed data from all reported crimes in Rwanda during 1994 and have concluded that more Hutu were killed or brutalized than Tutsi before and after the Rwandan Patriotic Front (RPF) seized power in July 1994. This analysis, together with the “conspiracy and planning” acquittals of former top military officers in the ICTR Military-1 case has called the entire theory of a “planned genocide” into question. (e) safe passage for members of Ingabire’s defense team. The International Humanitarian Law Institute is directed by Peter Erlinder, professor of constitutional criminal law and international humanitarian law at William Mitchell College of Law in St. Paul, Minn., U.S. Supreme Court Chief Justice Warren Burger’s Minnesota alma mater. Erlinder is also lead defense counsel in the Military-1 trial at the U.N. Tribunal for Rwanda, the case in which four former top military leaders were acquitted of conspiring or planning to commit genocide or any other crimes, and the highest ranking defendant was acquitted of all charges, in December 2008. Erlinder is also president of ICTR-ADAD (Association des Avocats de la Defense) and past-president of the National Lawyers Guild in New York City. Professor Erlinder can be reached at [email protected].